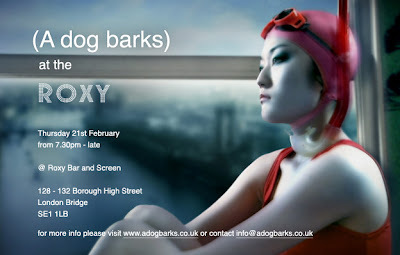 (A dog barks) @ The Roxy, London -Not To Be Missed! 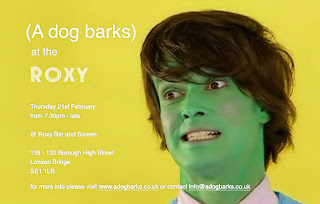 (A dog barks) a London based production company and good friends of Terrible love Songs, have announced an evening of innovative short film and music video at the Roxy Bar and Screen, London Bridge on 21st February 2008. The programme features some of the best shorts from around the world exploring the mediums potential to cross cultural and artistic boundaries. "This time we bring you Michel Gondry and Lauri Faggioni 's magical music video to Devendra Banhart's 'Ribbon' ; BAFTA winning 'Jo Jo in the Stars' ; the continuation of ever popular 'Lovesport' series by Grant Orchard plus many more. The evenings programme also features an exclusive preview of Turin Breaks new music video from their Dark On Fire album (released 17th Sept. 2007) by Shelly Love ahead of its official UK premiere at Birds Eye View Film Festival." The screening will be followed by music from DJ Chrissy H, the bar is open throughout the evening. If this evening is anywhere near as good as the last event (A dog barks) held at the Roxy, you won't want to be missing out. My advice, get there early, it'll be packed! 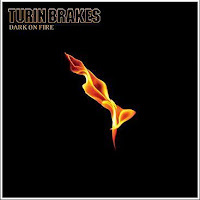 Click here to get a free legal download of the title track of Turin Brakes album Dark On Fire-my personal favorite. (A dog Barks) are interested in meeting musicians who are keen to have a music promo produced. They offer a variety of promo solutions from live gigs to conceptual storyboarding.